This was my first time trying candy from miles Kimball and I have t say that these old fashioned candy sticks are delicious too bad they are only seasonal because my family loved them I said if they bring it back I will order more than one can because they are so good. I would suggest anyone that orders from miles Kimball to try these you won't be disappointed. I like one of these in the evening, instead of getting up and getting a more caloric snack. The flavors are great (tangerine and watermelon are my faves) and one stick can last a good hour. I really would have kept these but they raised my blood sugar way to high so I gave them to a good friend who has a family to share with. My health is more important to me than sugar. I really did like them but had to pass them on to someone else. We purchase these yearly for our oldest son, and their presence at Christmas has now become a tradition. The flavors are varied and tasty, and the candies always fresh. We love these candy sticks. I give them often as gifts. My son still looks forward to receiving these as gifts every Christmas and birthday. Highly recommended. My grandsons really liked these. The unique flavors are sensational. My grandchildren experienced them for the first time and were competitive with choices! 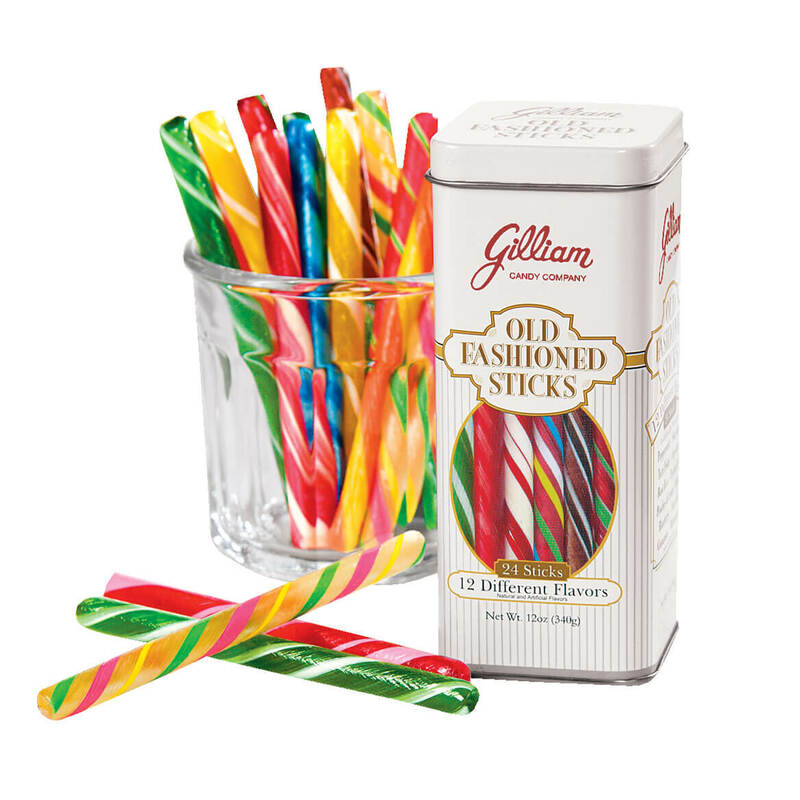 I love these candy sticks, there the type of candy that I like to buy during the holidays or when ever I come across them, there a sweet candy treat but there not overly sweet. It would be great to make up tins with your own flavors. I love the old fashion Candy Sticks. The only disappointment was that they were broken very badly. I don't think one out of the can was not broken at least in one or two pieces. I know they still taste the same but it would be nice if they were packed better. These had little flavor. Truly a disappointment. They were also all broken. "Old Fashioned Flavored Sticks" ....NOT! Old fashion fruit flavor sticks each and every one of them broken in so many pieces. Very disappointed. Thank you for your review. We are sorry to hear the Old Fashioned Flavor sticks was received damaged. Please contact our customer service by email at mileskimballcsr@silverstarbrands.com or by phone at 1-800-255-4590 and we can assist you further. We apologize for any inconvenience this may have caused. do not buy this product if you want the sticks to arrive in one piece. I ordered 4 boxes, intending to only use 12 sticks. I wanted to be SURE that I had at least 12 that could be used. To my shock, ALL 96 sticks arrived broken....not just in one place, so that I could salvage a few, but each one was broken in at least 3 places! I had to throw them all away. sounds tempting, but didn't taste as expected. the watermelon was awful,not fruity tasting at all.Each stick,although neatly packaged in a tin,was broken,every one! I tasted one for the first time a few months ago at Eckert Farms and liked it so I bought a can full. They sound delicious and I think my grandchildren will like them. I have loved these all my life. Love these. I’m not a peppermint lover but love candy canes. These are perfect. often want a simple sweet in the Summer. Also, tins are useful for other things when empty. Going to put these out after dinner. Old timey flavors.... Great taste. Others have given these rave reviews, plus I love the old-fashioned candy stick flavors. I had these years ago and I just wanted to see if they still taste the same. They remind me of my childhood. My doctor always kept a jar in his office and this was your treat after your visit or he brought some with him when he did a house call! I like the candy flavor. I like different candy sticks. It's a fun Christmas candy. Fond memories can't find in local stores! Love these, for stocking stuffers. Ordered these for a friend, and they were greatly appreciated. He loved the flavors. I've loved them since I was a little girl, so seeing them in the Miles Kimball catalog, I had to order them. Can't wait to get them...yummy!!! Use to buy these when I was a teenager. I haven't had these since summers on the boardwalk as a child. 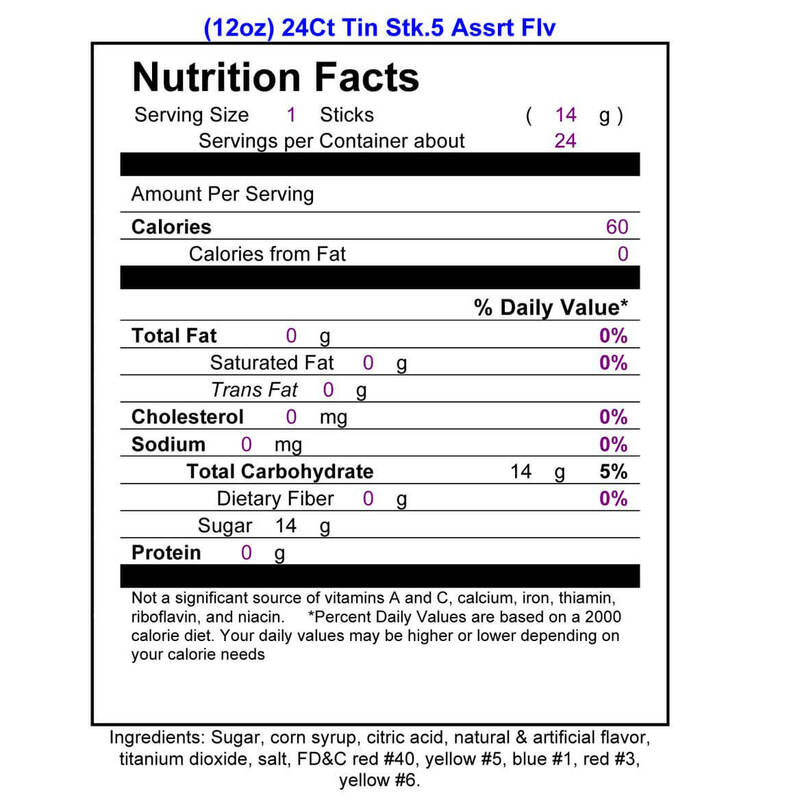 what us the calorie count for each candy stick? BEST ANSWER: Thank you for your question. One stick is 60 calories. We hope this information will be of help to you.